More than 11,000 people suffer spinal cord injuries each year in the United States. Many victims will experience severe chronic pain, paralysis and even death. Sudden trauma, such as a sudden blow or impact to the spine, may result in spinal injury, such as fractured or dislocated vertebrae. 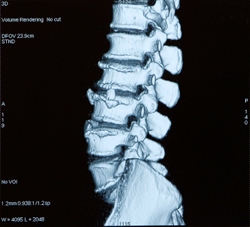 Most spinal cord injuries occur as a result of car accidents, which account for almost 47% of all such injuries. Fall downs (23%), violence (14 %) and sports (9%) also result in injuries. If the injury was caused due to the fault of driver of a car or truck, the manufacturer of a defective product or the owner of a neglected or hazardous property, the victim may have an important legal claim. If you have been injured due to a defective product or have experienced a car accident, fall down or work related spinal injury, speak to a knowledgeable attorney right away.